Discover Your Power Colors! What Season Are You? | if u open it, clothes it! if u open it, clothes it! Discover Your Power Colors! What Season Are You? Back when I was a little girl my mom came home one day and tried to figure out all of our family’s seasons. 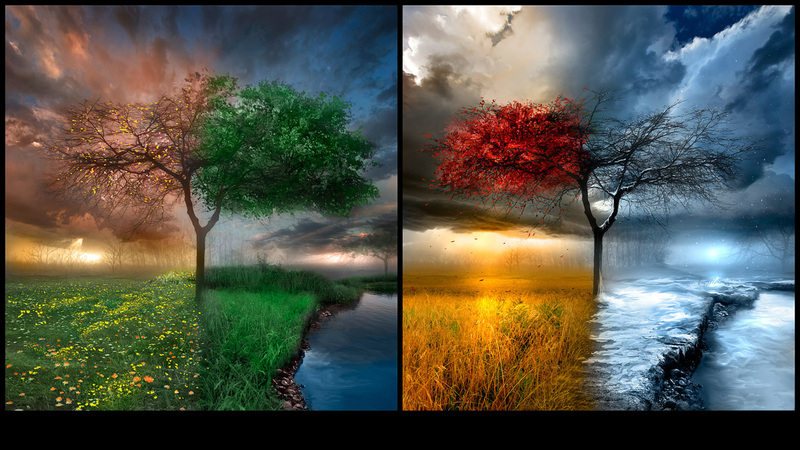 Are you a Spring, Summer, Autumn or Winter? It was all the rage at the time and it opened up a whole new world for me. Little did I know I wasn’t “supposed” to wear beige…ever!!! But once I figured it out, it made all the difference. Wearing the right colors for your skin tone, eye and hair color make you look radiant! Wearing the wrong colors make you look tired and well, sickly. Who wants to look sick? 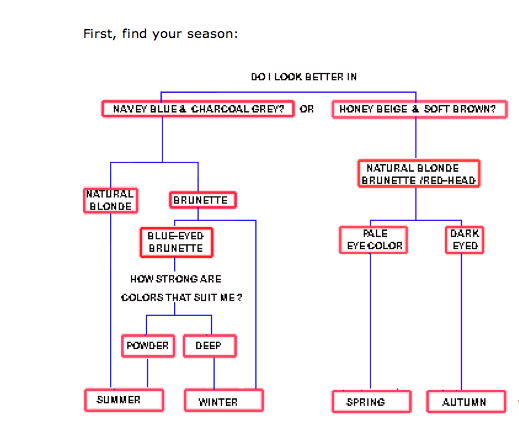 So follow this little diagram and it’ll help you find out what season you are! If you’re unsure as to whether you look better in navy blue and charcoal grey or honey beige and soft brown, then put something bright pink and bright orange up to your face. If you look better in the pink, it means you have cool undertones and you’re either a Summer or a Winter. If orange looks better on you, it means you have warm/golden undertones and you’re either a Spring or an Autumn. Summer complexions have blue or pink (cool) undertones. (When you blush you go rosy, not peachy) Your skin is pale and pink. Most Summers are natural blondes or brunettes with light-colored eyes. Gwenyth Paltrow, Michele Pfeiffer and Jennifer Anniston are Summers. Your power colors are cool blues and soft neutral colors but stay away from black and orange! Blue-red yes, orange-red no. Wear silver instead of gold. 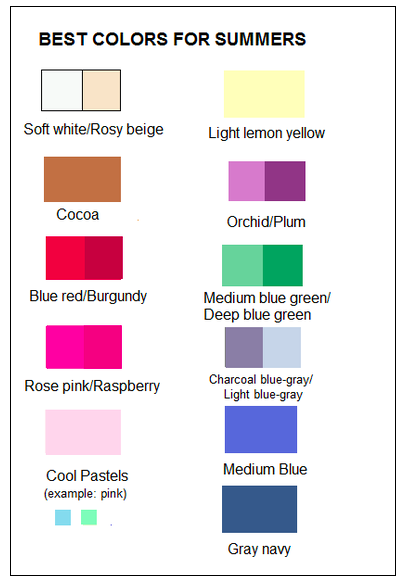 In addition to the above chart, these colors look great on you too: cadet blue, powder blue, sky blue, periwinkle, powder pink, deep rose, soft fuschia, watermelon, lavender mauve and rosy brown. Winter complexions also have blue or pink (cool) undertones. Skin can be pale white, yellowish-olive or dark. Winters usually have naturally dark hair and dark eyes but they can also have light eyes. Many Asians and Africans fall into this category. Some famous Winters are Courtney Cox, Penelope Cruz and Eva Longoria. Your power colors are black, pure white and jewel tones. Silver accessories look best. 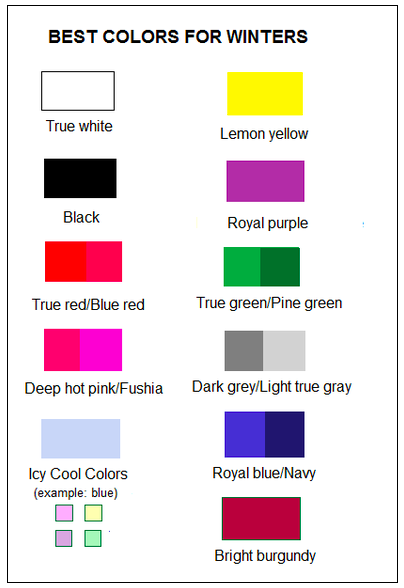 In addition to these colors, you also look great in turquoise, Chinese blue, emerald-green, light true green, shocking pink, magenta, medium grey and charcoal grey. Spring complexions have golden (warm) undertones and when you blush you usually turn more peachy than rosy. Most Springs have fair complexions and light-colored or strawberry-blond hair and blue or green eyes. Famous Springs include Scarlett Johansson, Nicole Kidman and Cameron Diaz. Your power colors are warm pastels, beige and camel. Gold accessories suit you best. Additional colors that look great on you are light warm beige, camel, light gold, bright yellow-green, apricot, peach, bright coral, bright warm pink, periwinkle blue, light blue, light warm acqua. Autumn complexions are darker versions of Springs. They also have golden (warm) undertones and are usually redheads or brunettes with golden brown eyes. Autumns look great in dark warm colors such as chocolate-brown and pumpkin orange. Gold accessories over silver highlight your complexion. Famous Autumns include Julia Roberts, Jennifer Lopez and Marcia Cross. 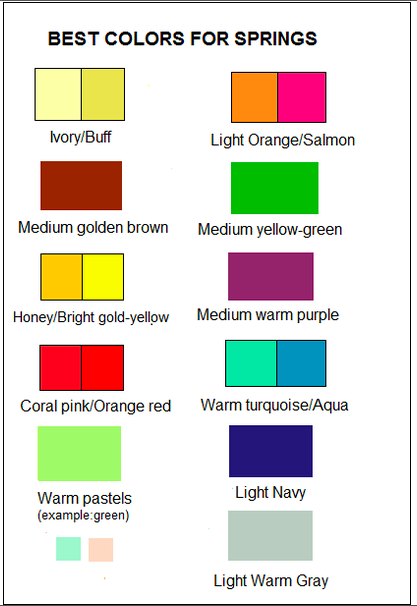 Additional colors that look great on you are camel, coffee, pumpkin, apricot, moss, grey-green, jade, dark periwinkle blue. Play my game: Decide what season these 4 celebrities belong to. Kate Hudson, Eva Mendez and Snow White and Reese Witherspoon. Leave your reply down below! What seasons do Kate Hudson, Eva Mendes, Snow White and Reese Witherspoon belong to? 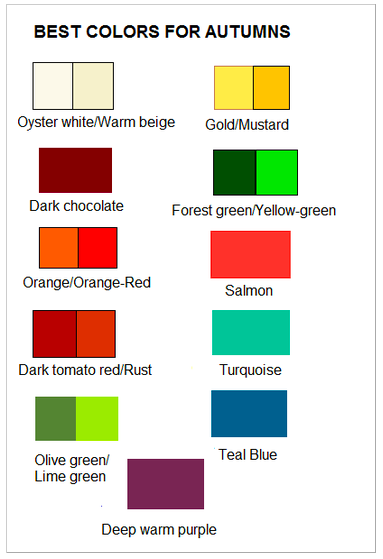 Find your season and your power colors. It’s time to look your best! This entry was posted in Colour Me Good!, Find Your Power Colors! and tagged Autumn, Power Colors, Spring, Summer, What Season Am I, Winter. Bookmark the permalink. 9 Responses to Discover Your Power Colors! What Season Are You? Your article is the greatest I have seen for a long time! Summer, autumn, winter, spring….in order (pics). I think I’m a winter. I have dark brown hair, blue green eyes and fair skin. But I seem to have trouble deciding whether I look cool or warm because even though cool colours for the most part are best, I do well in some warms too, so long as the colours aren’t too earthy or muted. Tried to find where I could play and answer which Season each belonged to, but couldn’t. My answer would have been Spring, Autumn. Winter and Summer. Right?? Yes you are right! Hope you enjoyed the article. My Marni for H&M Scores! © All content of 'if u open it, clothes it! ', 2011. Unauthorized use and/or duplication of this material without express and written permission from this blog’s author is strictly prohibited. Excerpts and links may be used, provided that full and clear credit is given to the copyright holder with appropriate and specific direction to the original content.